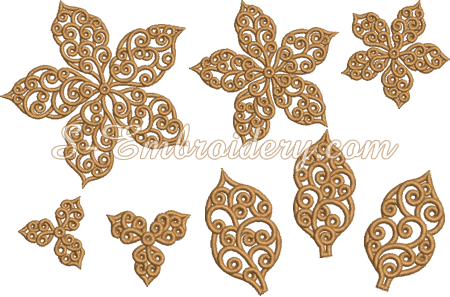 A set of 8 free standing lace poinsettia machine embroidery designs. Using the embroideries from this set in different combinations you will create 2 lovely Poinsettia Christmas ornaments like the ones featured on this page. 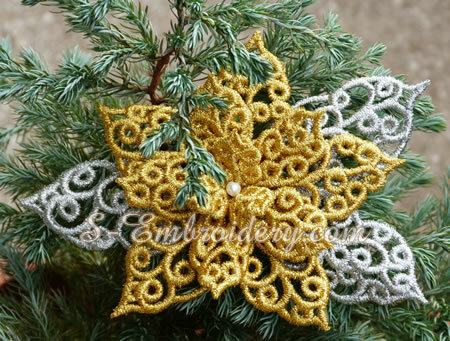 The larger poinsettia ornament will have a diameter of approximately 5 inches (13 cm) and the smaller one will be with a size of approximately 3 x 4.5 inches (12 cm). The largest design has a size of 5.06 x 5.06 inches (128.4 x 128.2 mm) and will fit in 5x7 (130 x 180 hoops). The smallest design has a size of (45 x 50 mm). The number of stitches ranges from 24,697 to 4,607. 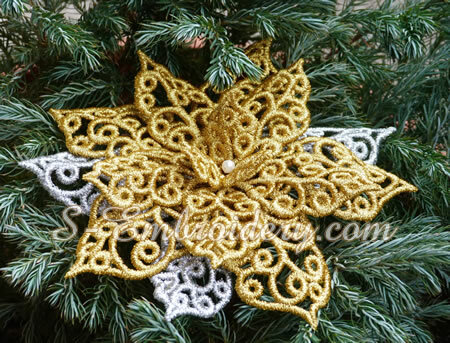 Important:The components of this poinsettia ornament set were designed to be stitched with metallic thread. 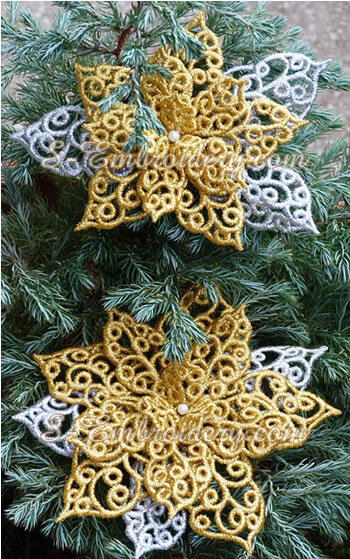 The ornaments shown here were created using combination of metallic upper thread and viscose as bobbin thread. We would strongly advise against using only viscose thread as with this type of thread one would not expect to achieve the look and shape of the ornaments, featured on our web site. The set comes with instructions for creating the poinsettia ornaments. You receive 8 machine embroidery designs in one of the supported formats and 2 PDF files with design information and instructions..